THREE RIVERS, Calif. — Recently, I traveled to Sequoia and Kings Canyon National Parks on a class trip. Michelle Fidler, the ranger in charge of public relations for the parks, met with us on our first day in the park. As my mind drifted to the mountains around me, Fidler caught my attention. She told us about the Junior Ranger Program and handed me a booklet with activities to complete in order to receive a junior ranger badge. The idea enticed me and I decided that I would get my junior ranger badge. Before Fidler could say anything, another voice rang out. Click on the video at the right to view a multimedia story about the Junior Ranger Program at Sequoia and Kings Canyon National Parks prepared by writer Gabriel Ibrahim. “I think you’re a little old for that,” my professor shouted with a smile. I calmly pointed at the front of the booklet. It read “ages 5-105.” At 21 years of age, I comfortably fell into that range. But, he had a point. The content of the book resembled the children’s menu at a restaurant with coloring, connect the dots, name this place, and so forth. As I began questioning the idea, Fidler jumped in to reassure me. With that, I took the booklet and began the journey to becoming a junior ranger. Nearly every national park has its own Junior Ranger Program and booklet. The program has a collectible aspect to it, as junior rangers are encouraged to get badges from other national parks. Many junior rangers own vests that they adorn with all their junior park ranger badges. 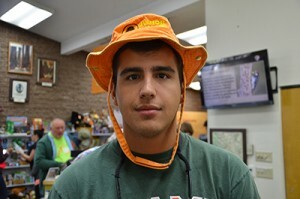 Writer Gabriel Ibrahim tries on a colorful junior ranger hat in the Foothills Visitor Center at Sequoia National Park. The sight of these vests puts a smile on park ranger Frank Helling’s face. Helling’s hope highlights exactly what the program aims to do. It hopes to instill a love of the national parks in junior rangers by encouraging them to explore, learn about, and protect the parks. I never understood the greatness about these parks, until I went to Sequoia and Kings Canyon. I knew the national parks were national treasures, but seeing what the parks had to offer put it into perspective. Now, I understand the importance of the Junior Ranger Program. It is a great tool to get future generations interested and invested in preserving these lands, which paramount to them surviving. A 6-year-old named Jayden drove the point home. As I meandered among the giant trees, I saw Jayden with a vest filled with badges and a booklet. I asked him how much he had done so far and he showed me his badge from Sequoia and Kings Canyon National Parks. Then, I asked him if he wanted to be a park ranger when he grows up. Jayden’s completed book drove me to finish mine that day. I worked hard and finished every part except one. The section called for an essay on how I would continue protecting the parks at home. Ranger Frank had mentioned this part to me earlier. I didn’t want to disappoint Ranger Frank. I wrote an entire page on how I could use my skills to protect the park. After I turned in the booklet at the Giant Forest Museum, Ranger Dawn Ryan checked it and told me I did a great job. She handed me the badge that I worked so hard for as my classmates applauded for me. I waved to the rest of visitors around me. They did not seem as thrilled as I was. Nonetheless, I did feel accomplished and felt a greater connection to the parks than before. After my experience, I would recommend the Junior Ranger Program for every national park visitor. It foster a relationship with nature, keeps you entertained in the parks, and you get a great souvenir out of it. Ask any ranger at any visitor center for a book. It is free at Sequoia and Kings Canyon, but other parks charge $3. Get your junior ranger booklet at the Foothills Visitor Center. 47050 Generals Hwy., Three Rivers, Calif. 93271. 559-565-4212. Open 8 a.m. to 4:30 p.m. Accommodations: Sequoia Village Inn; 45971 Sierra Dr. Three Rivers, Calif. 93271; 559-561-3652 (about 10 minutes outside of Sequoia National Park).